A new paper from Medraptors is just out now. The article compares the spring and fall migration of Short-toed Snake Eagles at the Apuan Alps and in a new watchpoint in Greece, the Mount Olympus. The results of this research show that also the Greek population of this species makes a long detour to avoid crossing the Mediterranean, via Bosphorus, both in autumn and in spring. In the article are analyzed and discussed differences in the percentages of juveniles migrating together with adults in the autumn at both sites. 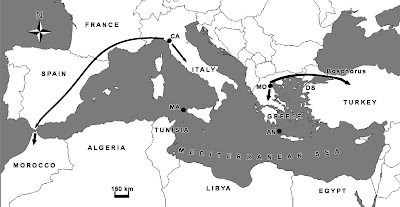 These results are put in relation with the width of ecological barriers in the study area, assuming that a relationship exists between the size of the stretch of sea that divides Europe from Africa and the tendency of juveniles to follow the adults during their first migration. Panuccio M, Agostini N, G Premuda 2012. Ecological barriers Promote risk minimization and social learning in migrating short-toed snake eagles. Ethology Ecology & Evolution 24: 74-80. Last week was held the second Eurapmon meeting in Murcia (Spain). Tens of researchers from 27 different countries of Europe, from Portugal to Russia, took part at the workshop. During the two days meeting, the National Coordinators showed the monitoring activities that are already active in the different countries. Moreover it was discussed a questionnaire to complete an inventary of the monitoring projects "with" and "for" raptors in Europe. For Italy ISPRA presented the actual situation. The new website is already active (to see it click here). Here below a picture of the workshop. Abstract of the Conference: "The migration of soaring birds. 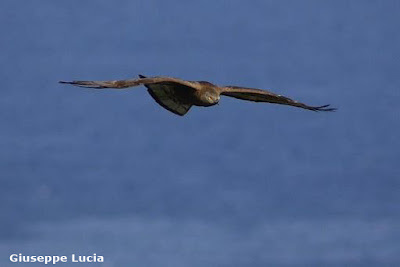 The role of the Adriatic coast"
Are available online the abstracts of the conference that has been held on October the 7th in Urbino "The migration of soaring birds. The role of the Adriatic coast". Among them also the Medraptors contribution. To download it (in italian) click on the picture below.